He is Yuzen kimono creator(artisan) in Kyoto. He is 70 years old. 50 years have passed since he engaged in creating kimono. because he is very particular about his works. But he is kind enough to show me his atelier and his works. These are tools he uses habitually. Most of these brushes are made by wool. He starts his work from making a sketch outside. because these sketches are the basis of his kimono patterns. Then he makes a drawing of kimono,reffering to his sketches. This is his conception of finished kimono. And he draws outline of flowers on a cloth. Special water colors are used for this outline. This is a roll of cloth for kimono(finished). This is also his work. Camellia and Japanese apricot designs are beautiful. These kimonos are also his works. It takes about 1 year to create a kimono. Sometimes he stays up all night to finish his kimono. His kimonos are full of originality. These works are the fruit of his great labor. 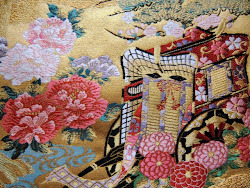 I love yuzen dyed kimono, they often are gorgeously designed with so much small details. I'm very happy if you like this kimono. Yes,details,hand-drawn patterns are so small and delicate,that is one of a characteristic of Yuzen. Yuzen dyeing requires skill and experience,and creatuve power. I'm sorry I'm very late for replying to you. It's an amazing work! Such beautiful and delicate designs and colors! He will be pleased to hear your impression on his work. His work needs perseverance and patience.And he loves his work.There are many artisans like him in Japan. I hope their works and their techniques will be handed down from generation to generation.